Which you could fix without affecting the lightness of the pillars, btw. When you gonna make this game man? You've been making these backgrounds for years! Really solid stuff as always. all I can suggest is more change in the variation tiles to make things less mechanical. Of course you're often doing architectural stuff it seems, where it's easier to fall into that. I opted to adjust the brightness and shading a little bit rather than add a detail like a railing; that adds more of a divide in depth than i want to have, as ideally the stairs should be only directly in front of the pillars behind it. I may still make the pillars darker but that's something I'm going to worry about when I've made some more progress. 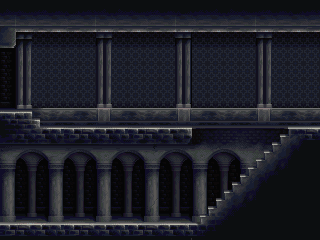 Similarly, I might edit the bottom part entirely to make some stronger shadows under the second floor and behind the two rows of pillars. Ryumaru: Long time no see, haha. I've rebooted it a couple times since then and I've been working on getting my art abilities where I want them to be first. By mechanical, do you refer to tiling repetition, or do you mean the nature of the shapes? In any case, I've got an update here. I might be making the part above the "hole" something else entirely. Maybe something framed by columns with a sort of enclave in between them. I essentially finished it. 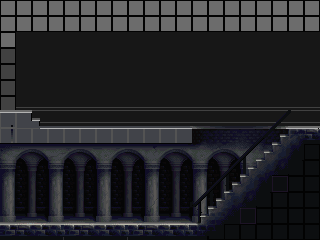 I should note, this background is also a mine for tiles so it doesn't exactly represent a completed set-piece. It's been a while since I touched a lot of it, and I think I've kind of gotten used to some of the areas, so I'm not sure how the foreground/background contrast is working out right now. I might go back and alter that and give it some stronger shadows on the bottom half and maybe darken the pillars slightly. I don't want this to be quite as stark as Symphony of the Night in its contrast (although that's certainly a big influence and I appreciate the screenshots to illustrate your point) but I think I can probably work a little bit more towards that kind of level of things? I appreciate the C+C from everyone, and would definitely appreciate some more as well. I note varied hues in those castlevania screenshot, with purple-but-still-dark areas and copper details. Imho, this is lacking in your mockup, and gives it an "all black and white" feeling. I admit that the positive/negative contrast in these SOTN shots are a bit extreme, with this in mind, I tried to modify your BG while keeping your FG unchanged in my edit (but I made a rough FG selection so watch out for unwanted colors). I used color curves but basically I changed saturation/contrast/color shift in some places. And keep in mind that the forum's actual colors renders everything dark duller than it is, this is critical in this dark interior situation where dark shades are close to each other in value.